Stone Age4 Million Years Ago – 4,000 B.C. Metal Ages4,000 – 800 B.C. Classical Antiquity4,000 B.C. – 475 A.D. Early Modern1450 – 1750 A.D.
Industrial Revolution1699 – 1850 A.D. This documentary tour de force on the world’s greatest battles and the fearless men who won them. 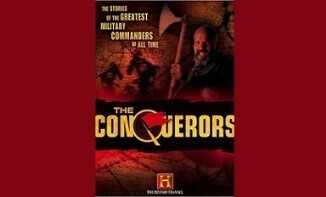 The Conquerors examines 12 legendary figures that altered the course of history through military brilliance and sheer willpower. Diary entries, interviews with scholars and heart-stopping reenactments examine the strategies, weapons of conquest and the significance of each engagement in the annals of history. Hosted by decorated war veteran Captain Dale Dye. Episode General Howe Conqueror of New York – He was an experienced commander sent to impose order on a rebellious colony. He soundly defeated the man who would come to be called “the father of the country.” Yet in the end, his victory proved fruitless. DocumentaryList.NET is now running on WordPress software what do you think of the change? What change? I don't notice any difference. Love the Search and the Speed! What other changes or features shoule we add?